Since Thursday, 28 july 2011 I've been added to this blog as a new contributor. Months have passed and I've contributed precisely nothing. What I've been doing instead was working feverishly on what is probably the most impossible and least awaited project of 2012. That's right, a complete implementation of the Realm of Chaos books within the WFB3 Army Builder files. Now before I delve into the intricate details of this, let me first explain Army Builder for those unfamiliar with it. Army Builder streamlines the creation of army lists, providing "point-and-click" simplicity and virtually eliminating mistakes. Instead of spending an hour to create a roster, it now takes a few minutes. Army Builder's validation engine constantly checks your roster against the rules for the game, flagging any errors with pinpoint accuracy. Since Army Builder takes care of the math for you, you can quickly experiment with different ideas and refine your army list. Add a new item, subtract some models from a unit, change the rules for the roster - Army Builder instantly recalculates points totals and revalidates the roster, allowing you to make changes in seconds. 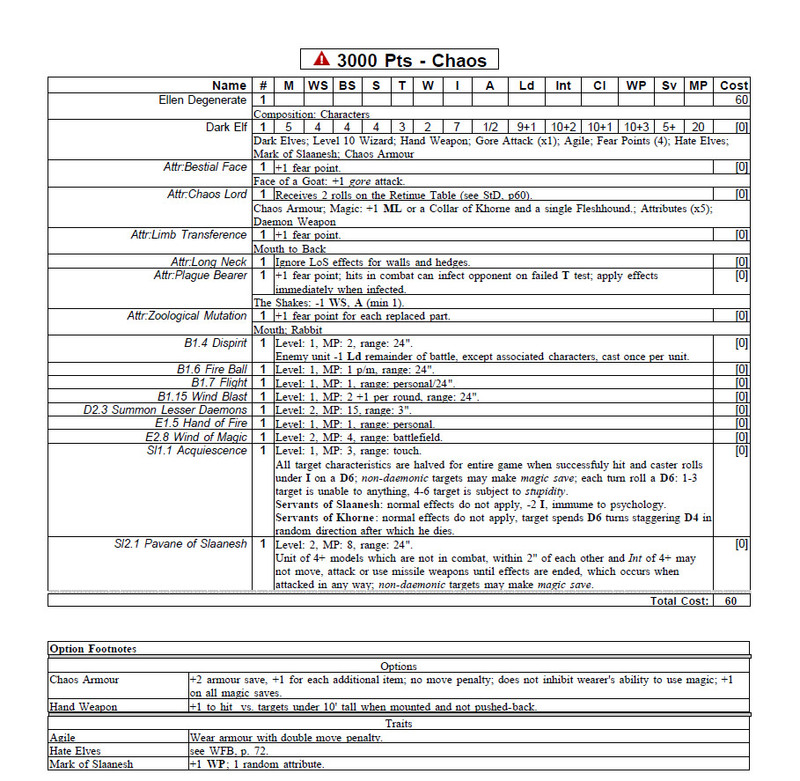 When your roster is complete, Army Builder can print out an invaluable "quick reference sheet" for use during game play, saving time and reducing costly errors. Between games, you can harness all this power and easily experiment with new army ideas. The software allows so called data file authors to create data files for virtually any point-based system. 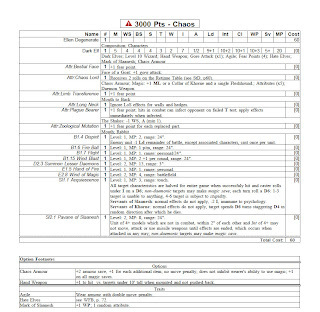 The data file central shows a list of all the currently available point-based systems for Army Builder. Anyone can become a data file author. 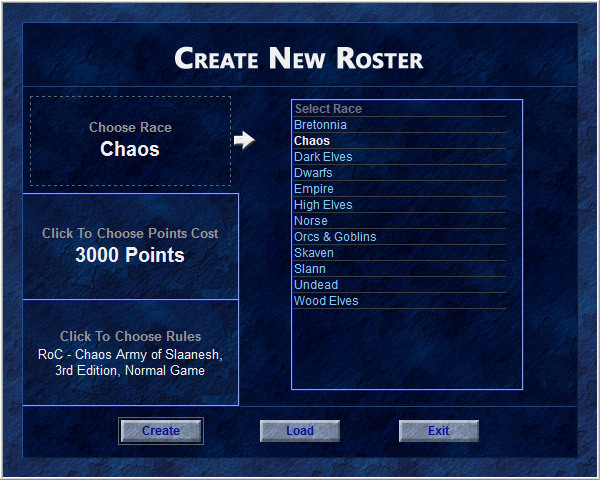 Being a programmer myself I thought it fun to create the data files for Warhammer Fantasy Battles 3rd edition. Little did I know that this "fun" project would take years to finish. The first version was published in October 2010. I believe I started somewhere in 2009. I completed the implementation of the Warhammer Armies book with version 1.32 on June 2011. This is around the same time when Gaj coined the idea of including the Realm of Chaos army lists. Thanks dude. After a quick investigation I figured it wouldn't take a lot of time if only including the rank & file troops. 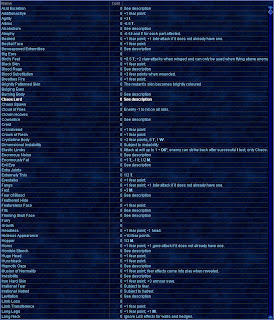 The Khorne and Slaanesh army lists where included in version 1.51 on July 2011. To be honest, I really don't know where to start explaining all the work done so far. At the time of writing I've implemented 115 attributes and almost all common gifts. All effects of the attributes are calculated and applied to the selected starting profile. There's still a lot of work to be done, like patron gifts, daemon and chaos weapons, war bands and the remaining attributes. Before continuing with this project and exposing myself to a certain insanity, I would like have some feedback on what has been made so far. To demonstrate the potential of the RoC data files, I present to you "Ellen Degenerate" made in Army Builder. 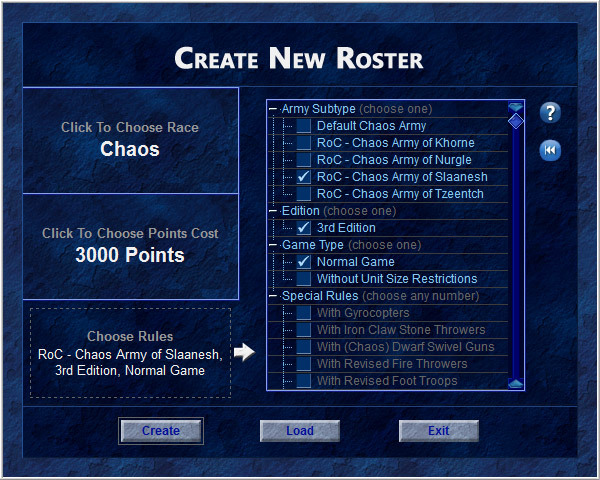 We start by selecting a new Chaos roster, and choosing the "RoC - Chaos Army of Slaanesh" army subtype. The other options are left untouched. The new roster has the following units available. 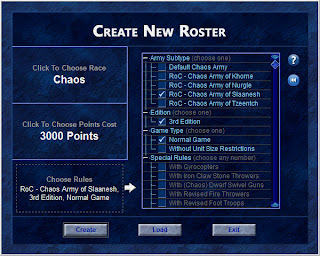 Selecting the "Champion of Chaos" unit from the roster presents us with the following options. Text marked in red means the option is invalid. In this case the validation roster reminds us that these options are mandatory. 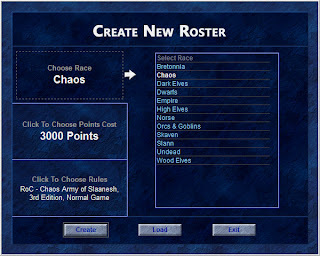 To create a CoC you need to select a starting profile and mark it with the Mark of Chaos. As explained in Gaj's blog post on Ellen Degenerate, she starts her rise/descent as a level 10 Dark Elf Wizard. The Mark of Slaanesh gives her the default gift of Slaanesh (+1 WP) and one random attribute. The starting profile is added as a child node to the CoC unit. 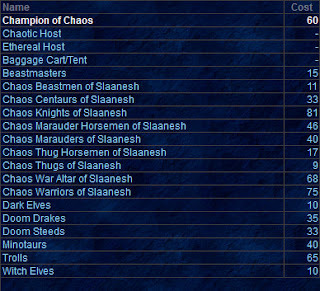 Notice how the name has changed to "Champion of Slaanesh" after selecting the Mark of Slaanesh, the profile is still that of a standard Dark Elf with the exception of the default gift of Slaanesh. Changing the profile to a level 10 Dark Elf Wizard is done by selection the "Level 10 Wizard" option. It's also possible to change the default unit names into something more appropriate. The random attribute is not added immediately after selecting the mark. This has to do with the way Army Builder works. Although AB supports random numbers, it cannot remember the number once generated. Random numbers are recreated each time the roster is updated. Basically every time you select or add something to the roster. To circumvent this problem, the user has to supply AB with the results. This means the user still needs the RoC books for consulting the various dice charts. We know Ellen rolled the "Chaos Lord" attribute as her first random attribute. The attribute is selected by clicking on the "Select Attribute" option. Notice that this is mandatory for completing the startup profile. A dialog appears in which the user can select an attribute. There are three different types of attributes. Those that affect the profile and those that don´t and those that are horribly complex. The Chaos Lord attribute falls under the latter. Each attribute has a description. The first part is a copy of the description as written in the RoC books. The second part describes the effects. 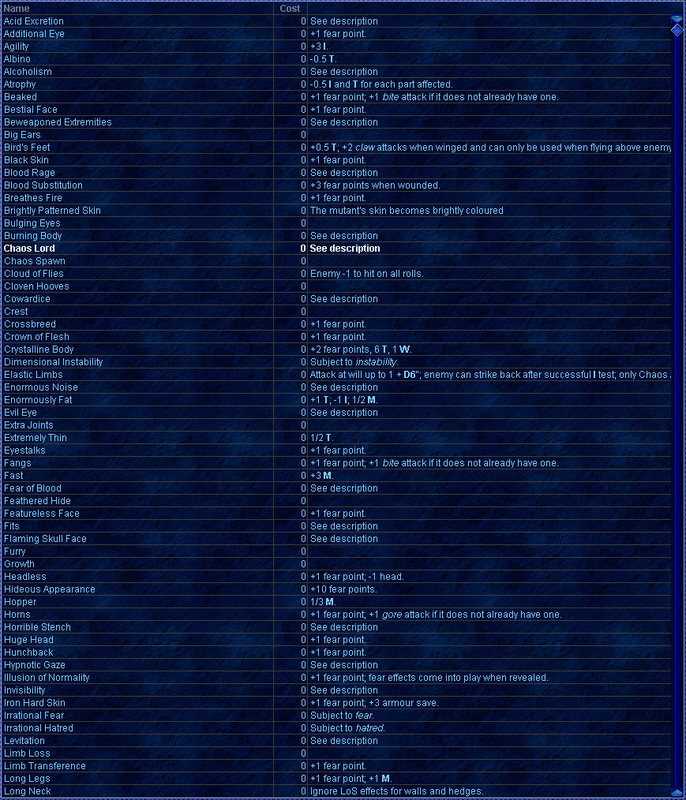 Attributes are added to the profile unit as child items, prefixed with "attr:". For this attribute the users needs to roll a D6 for each option presented and select it on a roll of 4+. Now, I'm not sure if Gaj rolled these dice, since he didn't mention anything about it in his blog post. Though he did mention he got the options 1,2,3 and 4. So, for the sake of this demonstration let's assume he did roll the dice. 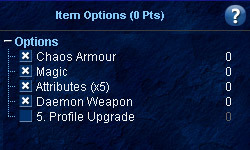 Selecting the "Chaos Armour" option adds the "Chaos Armour" item as a child to the profile unit. The first CA received gives it bearer a +2 armour save. Consequently normal armour options under the profile unit have now been disabled. Selecting the "Magic" option adds a +1 Magic Level, giving Ellen a total ML of 2 and access to Level 2 Spells. If Ellen was a follower of Khorne she would have received a Fleshhound and a Collar of Khorne instead, crazy right? Selecting the "Attributes" option causes a dialog to appear, asking to enter a number. This number represents the number of attributes. Ellen received 5 extra attributes. These additional attributes causes the "Select Attribute" option under the profile unit options to appear enabled and madatory once again. Although you can select it, the "Daemon Weapon" option is currently not supported. This leaves us with the following. The "Long Neck" attribute is one of those attributes that does not affect the profile. The easy ones. The "Bestial Face" attribute needs some special attention. Again, the red text indicates this. Let's have a look at the attribute description and options. 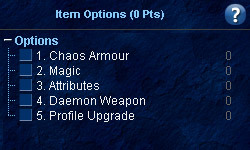 Just as with the "Chaos Lord" attribute, this attribute requires user input. However, these options are mandatory and only one can be selected per attribute. There, Ellen now has a "Face of a Goat", gaining +1 Fear Point and +1 Gore Attack. Two D100 need to be rolled, the result can be entered by the user. One part is replaced, and +1 Fear Point is added to her profile. Another one of those complex attributes that need user input. Again, this attribute adds another +1 Fear Point to her profile. The Shakes cause -1 WS and A, but the stats cannot drop below 1, so A stays the same. The Plaque does add another +1 Fear Point. The spells are selected under the appropriate Level categories. Exporting the roster to PDF creates the following document. This concludes the creation of Ellen Degenerate. This demonstration only shows a small part of what is implemented. I'm not completely confident in publishing it yet, I guess I'm just looking for some feedback and mental support. If there're enough people actually wanting to use this, I might actually finish it, otherwise I'm not so sure. If you're only interested in the CoC creation, but don't want to spend money for an AB license, don't worry. The trail version allows the creation of up to 3 units. The CoC only occupies 1 unit, meaning you can create up to three champions without needing an AB license. Bravo, Mr Dreamfish! Bravo! I wait with baited breath for the weekend, when my parental duties might relax enough to allow me to investigate the file. This is crazy! It's also one of the most awesome things ever! Kudos to you Dreamfish, it must have taken a huge amount of work to implement this. Looks nice, but call me old fashioned, i prefer the old pencil and paper. Very impressive stuff! I feel a little intimidated by the beast but this program will be invaluable to us. PLEASE FINISH!!!!!! And many thanks for all your hard work on these projects so far! I just finished implementing all personal attributes, except for: Chaos Were, Duplication, GM's Choice, Siamese Twin and Invent Your Own. I'll have to go through it one more time, and then I'll publish it. Other features will be included in another release. That's a splendid piece of work sir. As it happens, my own group have just rolled up a starting 40k Renegade warband and a Sensie Warband, so hopefully this will be of use to us! I shall post a link on Tales of the Maelstrom forthwith. Thank you Andy for your comments and for crosslinking this post. I hope it can be of any use to you and your group. If you find any inconsistencies, bugs or other weirdness, please let me know and I'll make sure there're solved in the upcoming release. You can post any problem related to the Army Buidlder files at http://forums.wolflair.com/forumdisplay.php?f=70. Oh, the (peer) pressure! So, a top 10 list!